We will feature the work of Noriko Sugita and Cheryl Williams in September. Noriko Sugita is a printmaker who works with traditional Japanese woodcut in a playful way, with complex layers of color, form and mark-making. 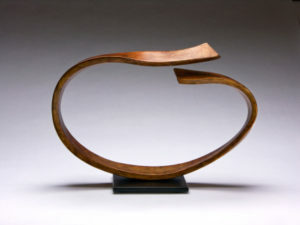 Sculptor, Cheryl Williams manipulates thrown ceramic forms into elegant, curving twists and circular shapes with often metallic or patina finish. Join us for a reception for the artists during the Ashland First Friday Artwalk, September 7th, 5-8 pm. Show runs September 7th – October 2nd. Noriko Sugita’s work depends on momentary inspiration, letting shapes and colors explore deep thought. Inventive and animated, her use of shapes and lines suggests human emotion and relationships or elaborate fictional worlds. 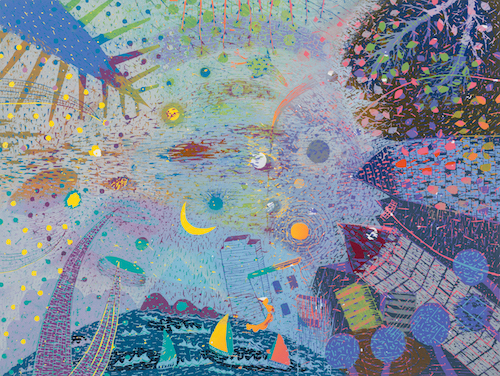 Sugita often layers thin pigments of saturated color along with active marks through a reductive woodcut printing technique. While this makes for small editions it allows for increased detail and color. Cheryl Williams was raised in California and spent time camping in the Sierra Mountains where she was influenced by the rivers, stones and light. She moved to Oregon to start a career in the Arts in the early 1980’s. After many years establishing herself as a ceramic artist she started painting large abstracts works on canvas using acrylic and gold leaf. Now in her 50’s, her art is shown around the world.